Thanks to Nan Swift for her post last Friday at Government Bytes, the blog of our friends at National Taxpayers Union for bringing to our attention the chicanery of Senator Tim Kaine (D-Virginia). "An 11th hour amendment to S. Con. Res. 11, the Senate Budget Resolution, could open the door to tax hikes to pay for increased spending, far above the Budget Control Act (BCA) caps. "The text of the amendment reveals that it would “provide for sequestration replacement” by creating a “Deficit-Neutral Reserve Fund Relating to Revise or Repeal Sequestration.” It would provide such “relief” with offsets “in mandatory or discretionary spending programs and tax expenditures.” In other words, it would open the door to raise taxes in order to bust the budget caps that have helped restrain spending and reduce the deficit. (emphasis added). "It’s not clear that the amendment will be carried over into the final product that emerges from the upcoming Budget Conference, but it is clear that there is a bipartisan appetite for more spending and tax increases are on the table Because the amendment is a Deficit Neutral Reserve Fund, as opposed to a Spending Neutral Reserve Fund, tax hikes could be used to fund increased spending, rather than finding offsets elsewhere in the budget. "Using tax hikes to undo the BCA would imperil our already anemic economy, kill jobs and send investment overseas. No matter how you run the numbers, there’s no way we can tax ourselves out of the fiscal morass we find ourselves in and imposing more costs on the most productive areas of our economy would only compound the problem. Note the bipartisan support of the amendment. Some members of Congress just can't seem to stop themselves from taxing and spending the income of hardworking Americans. Note the names of the five Republicans -- Alexander (R-TN), Ayotte (R-NH), Collins (R-ME), Corker (R-TN), Graham (R-SC), and McCain (R-AZ). Senators who claim to be fiscally conservative, but they have certainly not garnered conservative scores, according to Conservative Review's scorecard. Of the five who joined with Sen. Kaine, all have currently letter grades of F, representing scores of below 60%. On the other hand, nine Senators have scores of 100% (an A). Scores of some familiar Senate names include Tim Scott (R-SC) - 88% (B); Rand Paul (R-KY) -- 95% (A); Mike Lee (R-UT) -- 100% (A), and Marco Rubio (R-FL) -- 80% (B). Ask for a written response. And, tell them ACTA sent you. "The problem with public debt is that governments that borrow impose on other people - future taxpayers (many of whom don’t vote in today’s elections!) - the obligation to repay. As a result, governments tend to borrow excessively and to spend the proceeds carelessly. The costs to society of the resulting misuse and misdirection of resources are not in the least reduced by the fact that the debt is held internally." Source: Letter to NY Times responding to a Paul Krugman column, posted February 10, 2015 at Cafe Hayek. "Progressive taxation of income and profits means that precisely those parts of the income which people would have saved and invested are taxed away." Source: page 128, "As Certain as Death: Quotations About Taxes," 2010, compiled by Jeffrey L. Yablon, TaxAnalysts.com. "Those who create the wealth naturally want to keep it and devote it to their own purposes. Those who wish to expropriate it look for ever more-clever ways to acquire it without inciting resistance. One of those ways is the spreading of an elaborate ideology of statism, which teaches that the people are the state and that therefore they are only paying themselves when they pay taxes." Source: page 215, "As Certain as Death: Quotations About Taxes," 2010, compiled by Jeffrey L. Yablon, TaxAnalysts.com. HT Robert W. Wood, Forbes magazine. Does Arlington County's member of Congress share the same environmental concerns as the constituents he serves? Let's start by looking at the concerns expressed in a recent Gallup survey. At CNS News on Wednesday, Michael Chapman reports that "Americans’ concern over environmental issues such as water and air pollution and extinction of species is down from last year, and the data show that of all green issues, Americans worry the least about global warming (or climate change)." He cites this Gallup survey as his source. "The results are based on Gallup's annual Environment survey, conducted March 5-8. Gallup trends on many of these items stretch back more than two decades. Last year's increased worry has proved temporary, with the current level of worry on each of the problems back to about where it was in 2013. "Despite ups and downs from year to year in the percentage worried about the various issues, the rank order of the environmental problems has remained fairly consistent over the decades. Americans express greater concern over more proximate threats -- including pollution of drinking water, as well as pollution of rivers, lakes and reservoirs, and air pollution -- than they do about longer-term threats such as global warming, the loss of rain forests, and plant and animal extinction. 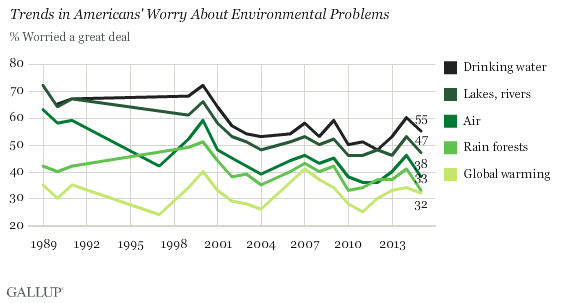 "The amount Americans worry about the various threats tends to rise and recede in unison, with concern higher in the late 1980s and early 1990s during the revival of environmentalism, and in the late 1990s and early 2000s amid the economic boom. Since then, Americans' worry has fallen, with concern dipping to record lows on most issues in 2010 or 2011. The current level of worry on each issue remains at or near those record lows." "When Gallup broke the data down by political party, Republican versus Democrat, it found that only 13% of Republicans worry a “great deal” about global warming in 2015 while 52% of Democrats worry a “great deal” about the issue. "For all the fright-mongering of the last quarter century, Americans still aren't getting too heated up about global warming." "Given the narrative that's been pushed for decades, the relative lack of concern about global warming is somewhat surprising. Frankly, it appears the effort to instill fear has failed. "Gallup says that "Americans' worry about it is no higher now than when Gallup first asked about it in 1989." "Meanwhile, the percentage of Americans who believe global warming will never happen or not happen in their lifetimes decreased a single percentage point from 34% to 33%, both numbers off the all-time high of 35% of 2010 and 2011, but still significantly higher than the mere 23% who believed in 2006 that it would not happen. "The portion who believe it has already begun crept up to 55% from 54%. But that's down from highs of 60% in 2007 and 61% in 2008. "Perhaps most important is the fact that the percentage of Americans who "believe increases in the Earth's temperature over the last century" are natural has gone from 33% in 2001 to 41% this year, and at the same time the portion who believe that man has indeed caused the Earth to heat has fallen from 61% in 2001 to 55% in 14 years. "This is the reality of models' projections vs. observed temperatures hitting home." "After a long career as a car dealer, lieutenant governor and ambassador, Democrat Don Beyer was elected to the U.S. of House Representatives last year with a focus on protecting the planet against climate change. “More than 7,000 Americans lost their lives to climate change-fueled events last year,” he wrote. "Beyer posted a similar statement on his congressional website on Feb. 4, saying climate change caused “almost 7,000” U.S. deaths last year. We wondered whether his claim is correct and asked for the source of Beyer’s information. "Beyer wrote, "More than 7,000 Americans lost their lives to climate change-fueled events last year." The congressman lacks documentation and admits he got his facts wrong. That makes our work easy: We rate Beyer’s statement False." "The misleading nature of Beyer’s claim goes even further; to the heart of the global warming debate. Democrats and environmentalists have been working hard to try and tie in nearly every natural disaster or severe weather event to global warming. "Indeed, Beyer himself argued that “[g]lobal temperature changes are causing prolonged droughts, extreme weather events and rising sea levels” adding that “[m]illions more are at risk unless we act to reverse the disastrous effects.” But such claims are dangerously misleading. You can read Rep. Don Beyer's February 4, 2015 Falls Church News Presse commentary in which he makes the claim about 7,000 deaths here. Porker of the Month -- "dubious honor given to lawmakers, government officials, and political candidates who have shown a blatant disregard for the interests of taxpayers." Citizens Against Government Waste (CAGW), a nonpartisan, nonprofit organization, has "named Environmental Protection Agency (EPA) Administrator “Big Sister” Gina McCarthy as its March Porker of the Month for her agency’s creepy plan to monitor the hotel shower habits of millions of Americans." "The EPA’s $15,000 grant to the University of Tulsa, under the People, Prosperity and the Planet student design competition for sustainability, “aims to develop a novel low cost wireless device for monitoring water use from hotel guest room showers. This device will be designed to fit most new and existing hotel shower fixtures and will wirelessly transmit hotel guest water usage data to a central hotel accounting system.” The monitoring device will be coupled with a smartphone app that would allow the user to access hotel water usage anytime, anywhere. "Administrator McCarthy requested a 6 percent budget increase of $452 million in the EPA’s budget for fiscal year 2016. She must feel the agency needs the money to implement the policies contained in the 27,854 pages by which the agency’s regulations have swelled since 2009. "For her agency’s unremitting and intrusive use of taxpayer dollars to intrude on the personal habits of Americans, EPA Administrator “Big Sister” Gina McCarthy is CAGW’s March Porker of the Month." Kudos to Citizens Against Government Waste (CAGW) for their continued efforts in bring government waste, fraud, and abuse to the attention of American taxpayers. 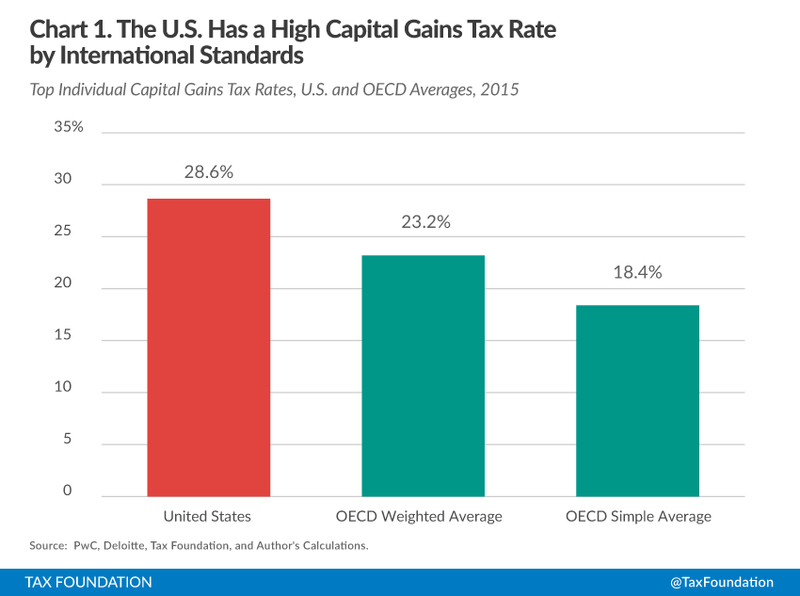 At the Tax Foundation's Tax Policy blog today, Kyle Pomerleau writes that American taxpayers "face the 6th highest top marginal capital gains tax rate in the OECD. The Organization for Economic Cooperation and Development (OECD) consists of "34 countries founded in 1981 to stimulate economic progress and world trade," according to Wikipedia. It "originated in 1948 as the Organisation for European Economic Co-operation (OEEC), led by Robert Marjolin of France, to help administer the Marshall Plan." "The current federal top marginal tax rate on long-term capital gains in the United States is a total of 23.8 percent (20 percent plus a 3.8 percent tax to fund the Affordable Care Act) for taxpayers with adjusted gross incomes of $200,000 ($250,000 married filing jointly) or more. In addition, states and some localities levy taxes on capital gains income, which range from zero percent in states with no individual income tax, such as Florida, Texas, South Dakota, and Wyoming, to 13.3 percent in California. "An individual who has capital gains income is subject to both federal and state capital gains taxes. Taking into account the federal deductibility of state taxes and the phase-out of itemized deductions, the average top marginal capital gains tax rate faced by U.S. taxpayers is 28.6 percent. Ask them for a written response. And, tell them ACTA sent you. There may be little or no growling for the next two days. The latest budget book from the Heritage Foundation features "106 ways to reduce the size and scope of government," but before getting into the thicket, let's look at one of their charts. Actually, the chart below is one of eight Heritage provides that show the growth of various aspects of the the federal government. 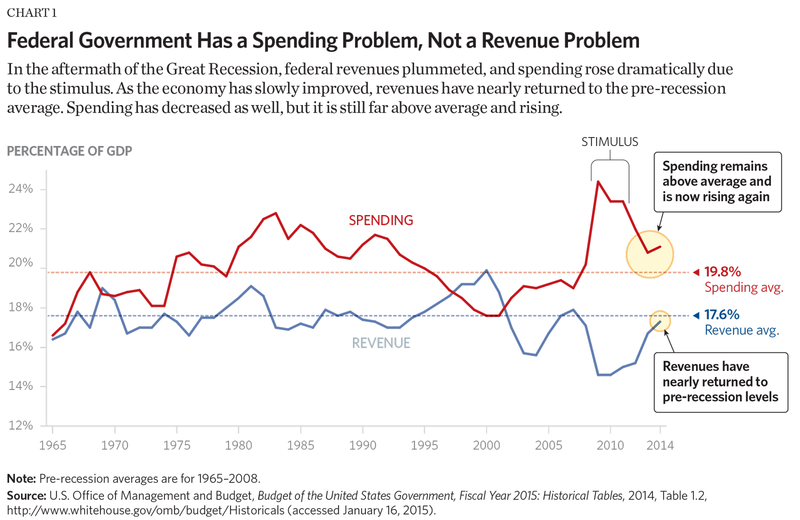 Here's the chart, which shows that government doesn't need higher taxes, but rather needs to reduce spending. Note that spending remains above its long-term average of 19.8% while revenues have almost returned to their long-term average of 17.6%. There are seven other charts that shows how other aspects of the federal government have grown. For example, chart 2 shows the growth in major regulations, chart 4 shows that all tax revenues will go towards entitlements -- primarily Social Security, Medicare and Medicaid -- and net interest by 2031, and chart 7 shows that sequestration does little to reduce total federal spending. The Arlington County Taxpayers Association (ACTA) has had the $80 million Long Branch Bridge Park aquatics center in its sights for some time now. Most recently, we mentioned it when we growled about Arlington County profligacy on December 31, 2014. "With $64 million in cash to work with, Arlington officials on March 17 restarted planning efforts for the next phase of Long Bridge Park following a 15-month time-out. “It would be irresponsible not to give it one more shot,” said County Manager Barbara Donnellan, who asked for and received County Board approval to move forward on a project that she put on hold in January 2014, when cost estimates for the proposed aquatics/fitness facility proved to be a budget-buster. "Arlington officials then cast their lot with those hoping to land the D.C. region as site of the 2024 Summer Olympics, hoping to leverage that possibility to build the pool facility. But the local area didn’t even make the cut as the U.S. finalist, a role that was won by Boston. "As a result, county officials now plan to reconstitute the park’s existing design committee into a broader task force, expand its membership and have it work with staff to come back with a viable plan by next January. "The March 17 action breathes new life into the multi-stage development of the park, located at the north end of Crystal City. Sports fields, parking and other amenities already are in place. McCaffrey provides additional details, which you can read here. For example, amount of remaining bond funds, a cap on the cost of the aquatics center, and a question by Board member John Vihstadt who asked whether the Parks and Recreation Department would be able to manage the project. "The Arlington County Board’s decision last November to scrap the Columbia Pike and Crystal City streetcar projects appears not to have caused any developer to scale back or scrap new projects along what had been the proposed routes, said County Manager Barbara Donnellan. "In the same breath, Donnellan acknowledged that she couldn’t be sure some of the projects in the development pipeline might not be delayed or deferred now that the streetcar plan was history. "Streetcar supporters had used the prospect of millions, perhaps billions, in new development along the Columbia Pike corridor as one reason to back the transit project. Streetcar opponents simultaneously questioned the dollar amounts, and suggested development might come regardless of the type of transit. "Quizzed by streetcar opponent John Vihstadt at the March 17 County Board meeting, Donnellan said there was no proof the change of plans has had a negative impact. “I don’t have any indication that has changed anyone’s direction,” she said." McCaffrey has more details so it's well-worth reading his entire article, including several alternatives for affordable housing in the county. "Only a handful of companies are taking advantage of an Arlington tax break intended to help bolster the county’s tech sector. "One possible explanation for the lack of participation in a program that could save companies thousands of dollars a year: many local tech companies say they haven’t heard about it. "Last year, the Arlington County Board approved a measure “to broaden the Technology Zone incentive program for new technology companies.” The action was trumpeted in a press release by then-County Board chair Jay Fisette. "As of March 19, however, only eight businesses had applied and subsequently qualified for “Technology Zone” status for their 2014 taxes, according to Deputy Commissioner of Revenue Ann Bisson. She could not say which companies had qualified nor how much local tax revenue those companies represent." It seems that rather than trying to build a larger leviathan of economic development, the new director should be using an existing tool in the AED toolbox. "What was supposed to be a forward-looking staff briefing on transit initiatives in the two corridors at the March 17 County Board meeting disintegrated into a rehash of issues that have been gone over, at length, before. "The squabbling, County Board member Jay Fisette said, was “disappointing,” and left board colleague John Vihstadt tired of “refighting old battles” – with each pointing a finger of blame at Vice Chairman Walter Tejada, the lone County Board member still supportive of the streetcar project and one who has been vocal in his displeasure at the turn of events. "Tejada counterpunched, saying at the meeting he would continue to call out the other four board members – particularly Vihstadt and Libby Garvey – if they made statements he felt were not backed up by the facts. "The bickering had the effect of prolonging, and perhaps undermining, a staff presentation aimed at looking toward the future of transportation in the two South Arlington corridors. The theme of the presentation: The streetcar may not be coming, but significant other improvements are." "Both meetings begin at 7 p.m. and will be held in the County Board room of the government headquarters, 2100 Clarendon Blvd. "The hearings represent “a great time for people in the community to tell us what they think,” County Board Chairman Mary Hynes said. "Advance registration for speakers is available on the Web site (here for the 3/14 Bidget Hearing, and here for the 3/26 Tax Hearing). Those who sign up to speak at the meeting also will be heard, but will be placed behind those who signed up in advance. "County Manager Barbara Donnellan has proposed a $1.15 billion fiscal 2016 budget that includes no increase in the existing real estate tax rate, but would see many homeowners pay more due to higher assessments. County Board members have advertised a higher tax rate, which, if enacted, would add more to the bills of property owners this year." Extensive budget information is available here, and includes the Manager's FY 2016 proposed budget, a schedule of County Board work sessions with the Manager, and follow-up items from County Board work sessions. The latter provide especially helpful information. Citizens Against Government Waste has "named Housing and Urban Development (HUD) Secretary Julián Castro its February Porker of the Month for putting the taxpayers at risk for yet another housing-related bailout. On February 11, 2015, Secretary Castro testified before the House Financial Services Committee at an oversight hearing on the Federal Housing Administration (FHA). The hearing was convened two weeks after FHA, in response to President Obama’s January 7 directive, reduced its mortgage insurance premiums by 50 basis points, from 1.35 percent to 0.85 percent." "The FHA runs a $1 trillion mortgage insurance program that traditionally provided coverage for low and middle-income first-time homebuyers. The agency is the largest single provider of mortgage insurance and has a 100 percent taxpayer-backed repayment guarantee should the homeowner default. In 2008, Congress “temporarily” increased loan limits for FHA insurance from $360,000 to $625,000 (where it remains today), which in turn raised the eligible income from about $64,000 to $110,000, hardly the low and middle-income homebuyers originally intended to be covered. "While the FHA website states that it is “the only government agency that operates entirely from its self-generated income and costs the taxpayers nothing,” that is not true. According to the Congressional Budget Office, FHA estimated that between 1992 and 2012, its mortgage guarantees would save taxpayers $45 billion, but instead they cost $15 billion. FHA also received a $1.7 billion bailout on September 30, 2013. In addition, FHA is required to maintain 2 percent in capital reserves, which would be between $18 and $20 billion, but it only has $4.7 billion, or .41 percent. "Ironically, on the same day that Secretary Castro testified, FHA was once again included on the Government Accountability Office’s High Risk List due to the agency’s “substantial growth in its insurance portfolio and significant financial difficulties.” FHA has been on the list since 2009. And Who Pays Federal Income Taxes? Our friends at the the National Taxpayers Union have updated their website with the latest date from the Internal Revenue Service on who pays federal income taxes. Specifically, they have "broken down the share of income taxes by gross income to show how much each AGI bracket contributes yearly." In addition to the infographic at the above link, they provide a Google spreadsheet that shows percentages ranked by AGI, the AGI threshold, and the percentage of the share of Adjusted Gross Income and the percentage of federal personal income taxes paid. Top 1%. AGI above $434,682. Share of AGI = 21.86%. Share of federal personal income taxes paid = 38.09%. Top 10%. AGI above $125,195. Share of AGI = 47.87%. Share of federal personal income taxes paid = 70.17%. Top 25%. AGI above $73,354. Share of AGI = 69.25%. Share of federal personal income taxes paid = 86.42%. Top 50%. AGI above $36,055. Share of AGI = 88.9%. Share of federal personal income taxes paid = 97.22%. Bottom 50%. AGI below $36,055. Share of AGI = 11.1%. Share of federal personal income taxes paid = 2.78%. Take a minute to compare the 2011 and 2012 data in the Google spreadsheet. The Top 1%'s share of income increased from 18.7% in 2011 to 21.86% in 2012, but the share of Federal federal personal income taxes paid increased from 35.06% to 38.09% in those two years. Finally, take a look at the bottom chart in the infographic, noting how taxes paid by the Top 1% and Bottom 50% have changed from 1980 to the present. In 1980, the percentage of taxes paid by the top 1% was 19.29%, but doubles to 38.09% in 2012. Over the same period, taxes paid by the bottom 50% decrease from 7.02% to 2.78%. It sure would be nice if the populists on the Left would get their statistics correct when they spew their class warfare rhetoric. Isn't it time for a flat tax in the United States so that we can prepare our income taxes on the back of a postcard? See, for example, this Hoover Institution "classic" on the postcard tax return. See also this American Enterprise Institute article by Dan Mitchell, which provides an worldwide overview of flat taxes. Finally, a 2011 post at Alvin Rabushka's Flat Tax blog. Imagine the economic growth that would be generated from coupling a flat tax and major reform of the current regulatory burden. Kudos to the National Taxpayers Union for continuing to track who pays federal income taxes. "The irony is that free people usually create far more wealth than the coerced, which makes the lower echelons better off, a fact that reminds “equality” is usually about empowering progressive elites rather than materially helping the poor. Moreover, in a free society, there are all sorts of forces — religion, constantly improving and ever cheaper technology, family pressures, honor, shame, philanthropy — that redistribute wealth either naturally or through the consent of the giver, and far more effectively than creating a huge government equalocracy that seeks power to bully others and exempt itself. Source: his January 14, 2014 National Review Online column. At the monthly meeting of the Arlington County Civic Federation on Tuesday evening, March 3, 2015, delegates heard the chair of Arlington County Economic Development Commission, Sally Duran, discuss "the importance of a flourishing business community which will substantially benefit Arlington taxpayers." The slides from her PowerPoint presentation are available here. The Civic Federation website provides additional, related information as well. The importance of maintaining Arlington's strong commercial tax base is depicted in the third slide that compares Arlington's 2014 tax base to the regional average. Last year, Arlington's tax base was 51% residential and 49% commercial, which compares to the regional average which is 70% residential and 30% commercial. In Arlington, the average residential payment last year was $5,278; by comparison, it's estimated the average residential tax payment would have to be $7,259, a difference of 38%, if the tax base split was similar to the regional average. Another of the commission chair's slides showed that Arlington's office rents are less competitive than in the past. For example a difference of $12.64 between comparable office space in Arlington and Tysons. She also noted that federal lease holdings have declined by 2.4 million square feet from 2011 to 2014. Office vacancy is 21.8% -- above its 15-year historical average. An increase of 10% in office occupancy would represent $34 million annually in local tax revenues. 4.4 million square feet (s.f.) of office space must be filled for the vacancy rate to reach 10%. The entire region is projected to add 3.6 million s.f. per year over the next two years. That's the challenge. Now let's take a look at how county management would meet that challenge, a look that involves the department of economic development in the County Manager's proposed FY 2016 budget. "Reduce office vacancy by half and diversify the Arlington economy over the next 36 months." The work effort, he says would fill 1.5 million square feet per year, or 125.000 square feet per month, or 29,000 square feet per week. By comparison, the Pentagon has "3,800,000 square feet for offices, concessions, and storage, according to InfoPlease.com. Furthermore, the challenge, according to one of the slides in The Way Forward presentation is that "net (office) absorption" was only "2.6 million square feet over the last 36 months." The 50% and 25% solutions would, obviously, require fewer resources and show lower returns on investment. Scroll up to those four 'takeaways' from the commission chair's presentation to the Civic Federation. Consider also that in the most recent economic outlook by the Congressional Budget Office, the economy, as measured by the gross domestic product (GDP) is projected to grow no more than 2.2% through 2025. By comparison, GDP growth from 1982 to 2001 was 3.2% and from 2002 to 2014, GDP growth was 2.1%. Now who would be willing to invest in that 100% solution, let alone a 50% or 25% solution? Note also in "The New Way Forward" plan is there any mention of addressing Arlington's less competitive market and the $12.64 difference in office rents. Consider also that any significant effort undertaken by Arlington County will certainly be matched by competitors in the region. So how should the county respond to the challenge of economic growth and increased economic freedom? The Kansas Policy Institute (KPI), a free-market think tank, features a study by the National Federation of Independent Businesses showing that small business is more concerned about taxes, regulations, and low sales rather than more government. Speakers at a 2012 KPI conference also generally advocated tax and government cuts as being better than public incentives for spurring growth. In a study from North Carolina's John Locke Foundation, John Hood suggests that state and local officials adopt a strategy that keeps "overall tax and regulatory burdens as low as possible." Instead of increasing the bureaucracy, Arlington's economic development department should develop a plan that involves ways of reducing the tax and regulatory burden for the Arlington County business community, including recommendations by which the Virginia General Assembly can partner with the County Board in those reductions. To see other FY 2016 budget presentations considered by the Board at their March 10 work session, see here. More detailed information about the department of economic development can be found in the Manager's proposed FY 2016 budget. "Climate change propaganda is simply a ruse for a socialist agenda. Consider the statements of some environmentalist leaders. Christiana Figueres, the U.N.'s chief climate change official, said that her unelected bureaucrats are undertaking "probably the most difficult task" they have ever given themselves, "which is to intentionally transform the (global) economic development model." In 2010, German economist and Intergovernmental Panel on Climate Change official Ottmar Edenhofer said, "One must say clearly that we redistribute de facto the world's wealth by climate policy." The article in which that interview appeared summarized Edenhofer's views this way: "Climate policy has almost nothing to do anymore with environmental protection. ... The next world climate summit in Cancun is actually an economy summit during which the distribution of the world's resources will be negotiated." "The most disgusting aspect of the climate change debate is the statements by many that it's settled science. There is nothing more anti-scientific than the idea that any science is settled. Very often we find that the half-life of many scientific ideas is about 50 years. For academics to not criticize their colleagues and politicians for suggesting that scientific ideas are not subject to challenge is the height of academic dishonesty." Source: His March 11, 2015 Column, posted at Townhall.com. Arlington County officials never cease touting that Arlington is a wold-class urban community (see this County Manager webpage). "Crews have been working around the clock to plow streets and have used salt conservatively, supplementing with sand. The County is currently clearing residential streets and will continue to do so for the remainder of the day and evening." For news coverage about the county's road salt reorder, see this Arlington Sun Gazette story today. We don't doubt the crews were hard at work. What we question is whether the management responsible for keeping road salt properly stocked have bought in to the world-class assertions ballyhooed by the Arlington County Board and the County Manager. A couple of days after major snowfalls, we don't see any evidence of world-class snow removal. Last Friday's press release about the salt shipment is merely the latest straw that the county's world-class vision statement is little more than political blather. In an Arlington Sun Gazette story posted this morning, Scott McCaffrey writes, "Arlington taxpayers likely to see bigger jump in (real estate) tax bills than neighbors in Fairfax." "Owners of single-family homes in Arlington would see their real-estate tax bills grow at a rate (in raw dollars) 78 percent higher than neighboring Fairfax County, under the tax rates advertised by the governing bodies of each jurisdiction. "The typical tax bill would rise $453 in Arlington and $254 in Fairfax. "Fairfax supervisors on March 3 voted to advertise a maximum tax rate of $1.115 per $100 assessed value, up from $1.1125 in 2014 due to an increase in a mandatory stormwater fee. Arlington County Board members advertised a rate of $1.011 per $100, up from 99.6 cents in 2014, including the stormwater fee. "Factoring in increases in assessments, the higher rates – if adopted – would see tax bills rise to an average $7,990 in Arlington and $6,914 in Fairfax." "But Tim Wise, president of the Arlington County Taxpayers Association, says any rise in tax bills should be met with anger in the community. He points to federal data showing stagnant wages in the local area. “Sounds as if the County Board needs to start prioritizing core spending rather than satisfying every last special interest,” Wise said." ". . . For the first time in recent years, the government-wide improper payment estimate significantly increased—to $124.7 billion in fiscal year 2014, up from $105.8 billion in fiscal year 2013. This increase of almost $19 billion was primarily due to estimates for Medicare, Medicaid, and the Earned Income Tax Credit, which account for over 76 percent of the government-wide estimate . . . ."
"The federal government faces an unsustainable long-term fiscal path. Changing this path will require difficult fiscal policy decisions to alter both long-term federal spending and revenue. However, in the near-term, executive branch agencies and Congress can act to improve the efficiency and effectiveness of government programs and activities. Opportunities to take action exist in areas where federal programs or activities are fragmented, overlapping, or duplicative. We annually identify and report on these opportunities as well as those to achieve other cost savings or enhanced revenues." "Federal agencies across the board are continuing to waste tens of billions of taxpayer dollars on duplicative spending efforts, even after Congress‘ official watchdog has made hundreds of recommendations for cutting back. "The spending issues, ranging from Medicare and Medicaid mismanagement to transportation programs to weapon systems acquisitions, cost taxpayers $125 billion in improper payments in 2014 alone, as highlighted in a new report from the Government Accountability Office. "Over the last five years, the GAO said it has made 440 recommendations across 180 areas where federal agencies can cut back on fragmented, overlapping and duplicative spending programs, but as of November 2014, only 29 percent of the actions were fully addressed, according to the report. "Private watchdogs say the GAO survey only strengthens their case that government waste and abuse are rife, and that it is taxpayers who have to foot the bill. “According to GAO, the federal government made about $125 billion in improper payments in 2014 alone. Solving that would give you enough money to kill the death tax, repeal the federal gas tax and airline ticket tax, end all federal excise taxes on alcohol and tobacco and remove all federal taxes on phone and Internet bills,” said Ryan Ellis, tax policy director at Americans for Tax Reform. Read Kellan Howell's entire Washington Times article here. You can access both the highlights and entire GAO report here. The website of the Senate Budget Committee's chairman, Mike Enzi (R-Wyoming) has two related press releases. In one, he applauds "Senator (Kelly) Ayotte’s bill (S. 236) (that) would save billions of taxpayer dollars by making it easier for Congress to eliminate duplicative and wasteful programs across federal government agencies. In a second release the same day, Sen. Enzi said, "one way Congress could tackle America’s chronic overspending problem is by rooting out needless duplicative spending and programs in the federal government." Imagine that. The federal government wastes the equivalent of a $60 tax cut for everyone in America, I say. You'd think some fahn politician would think to make that a campaign pledge to rid America of the scourge, wouldn't you? Arlington County Paychecks Big, but not Growing! We missed the news item three weeks ago, posted by the Arlington Sun Gazette, when the newspaper reported "(t)he average weekly wage of those employed in . . . Arlington County remains among the highest in the nation, but the rate of growth – well, no growth in wages appears to be happening." "With an average weekly wage of $1,516, Arlington ranked sixth nationally among counties in the second quarter of 2014, according to new figures reported by the federal Bureau of Labor Statistics. "But year-over-year, that figure declined 0.6 percent. That was the ninth-worst performance of the 339 largest counties in the nation. "During the quarter, the average weekly wage nationally was $940. In Virginia, it was $976, 11th largest among the 50 states and District of Columbia. "Employment within Arlington was down from the third quarter of 2013 to the third quarter of 2014, dropping 1.4 percent to 165,400, according to federal figures." Source: Quotes About Taxes at Goodreads.com. Arlington County Board Gets a "Thumbs Down"
On the editorial page in this week's Arlington Sun Gazette, "County Board members – all five of ’em – who voted to advertise a real estate tax rate 1.5 cents higher than its current rate" received an editorial "Thumbs Down" in the "Highs & Lows" section. "Board members wrapped themselves in the self-righteous mantle that this vote isn’t a final decision, but merely gives them flexibility as they move forward in the budget season. "For homeowners, it adds insult on top of injury, offering the prospect of a double-whammy: a higher tax rate on top of higher assessments. For the owner of a typical single-family home, that could mean a tax-bill increase of more than 7 percent. "It also encourages organizations that rely on funding from the county government to mobilize and advocate, so they don’t miss out on the larger prospective pot of cash that could be available, rather than accept the reality that we are still in constrained economic times. "Advertising a higher tax rate – whether it ends up being adopted, or not – is a disservice to the community. We had hoped for better from the County Board." Kudos also to the second "Thumbs Down," too, which was "(t)o the prospect that the Artisphere might rise, phoenix-like, from the dead this budget season." "Innumerable studies, going back decades, show that women do not average as many hours of work per year as men, do not have as many consecutive years of full-time employment as men, do not work in the same mix of occupations as men and do not specialize in the same mix of subjects in college as men. "Back in 1996, a study published in the New England Journal of Medicine showed young male physicians earned 41% higher incomes than young female physicians. But the same study showed young male physicians worked over 500 hours a year more than young female physicians. "When the study took into account differences in hours of work, in the fields in which male and female doctors specialized and other differences in their job characteristics, "no earnings difference was evident." "In other words, when you compare apples to apples, you don't get the "gender gap" in pay that you get when you compare apples to oranges." "Dynamic scoring is a tool to give members of Congress the information they need to evaluate the tradeoffs in tax policy changes. "Dynamic scoring provides an estimate of the effect of tax changes on jobs, wages, investment, federal revenue, and the overall size of the economy. "Using dynamic scoring, policymakers can differentiate between policies that look similar using conventional scoring methods, but have vastly different effects on economic growth under dynamic scoring. "For example—using Tax Foundation’s Taxes and Growth model—we find that five tax change with the same static revenue cost can have vastly different effects on GDP, investment, jobs, and federal revenue—ranging from virtually no change in GDP to an increase of over 5 percent. "The use of dynamic scoring is crucial to ensure that comprehensive tax reform grows the economy and meets revenue expectations." "Despite the recent criticism of dynamic scoring, Members of Congress are being ill-served by the current conventional, or “static,” scoring method, which provides lawmakers a very one-dimensional picture of the effects of tax changes. "If Members of Congress are to make sound tax decisions that impact today’s complex, global economy, they need the three-dimensional perspective that is only possible with dynamic scoring. "As we have seen, five different tax policies that conventional scoring would say have the same cost to the U.S. Treasury, can have very different effects on the economy and, ultimately, on federal revenues when those effects are accounted for. "The primary goal of comprehensive tax reform is economic growth. Conventional scoring treats this process as an exercise in arithmetic, whereas dynamic scoring makes the process an exercise in economics. The well-being of the American people is at stake. It is critically important that lawmakers make the right choices that lift everyone’s standards of living. Only dynamic scoring can help them do that." For more about the appointment of Keith Hall as CBO director, see this release from George Mason University's Mercatus center as well as this Washington Post story, this story from Politico, and this Fiscal Times story. At Townhall.com on February 12, 2015, columnist Dan Mitchell, a senior fellow at the Cato Institute, has a detailed explanation, with numerous links, explaining both the Laffer Curve and "why 'dynamic scoring' is far more accurate measuring the impact of fiscal policy changes." "The recent rule change by House Republicans to incorporate the macroeconomic impact of major legislation into official budget estimates—“dynamic scoring”—has triggered heated criticisms. But three decades of hard accounting data, in addition to supporting the rule change, should prompt Washington to reconsider the way it thinks about what drives federal revenues. "One fact above all others emerges from the data: Economic growth is the single most powerful determinant of federal revenues." "The 114th Congress can make history by using computer-aided dynamic analysis to quantify and disclose to voters in stark dollars-and-cents terms the heretofore hidden, but nevertheless real, harm that government is doing to them. Voters can then for the first time weigh the true costs of government against its benefits." "Like truth in general, dynamic analysis can help bring about beneficial changes in taxes, regulations, spending and almost everything else Washington does. "Putting the facts out on the table may also beneficially affect how election campaigns are conducted and who wins. "No matter how the truth is arrived at, the overriding goal is accurate scoring of the costs and benefits of government." Without economic growth, it is hard to see how the nation can emerge from all the debt that our politicians have created. Of course, we probably should not have elected them, but that is a story for another day.